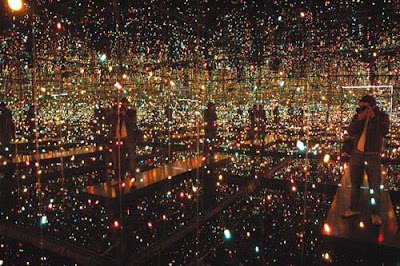 Pop Artist Yayoi Kusama’s Spaced Out. See the multiplication of the space and the idea of infinite in the location of mirrors and lights. Internet download. Probably, it can be seen as the negation of the Architecture, of the static building, the space is shaped by weird acts and consequent behaviors. 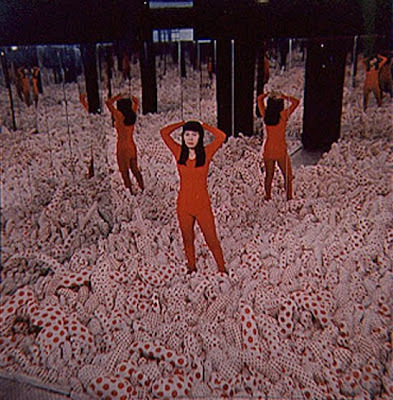 Pop Artist Yayoi Kusama. Endless Love Room. 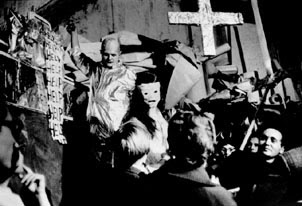 1965-6. The Happenings were designed for a brief life, they are dead every time they happen. It is an ephemeral game, the game of obsolescence felt in a certain state of mind; the objective is to stimulate as much fantasy as possible. The situations can be commented by the stories told through the years, they can be printed in photographs, but you need to participate to feel the real nature of a “Happening”. Jim Dine, The Car Crash, 1960. 1) The line between the Happening and daily life should be kept as fluid and perhaps indistinct as possible. For example, two cars collide in a freeway; violet liquid pours out of the broken radiator of one of them, and in the back seat of the other there is a huge load of dead chickens. The cops check into the incident, plausible answers are given and this is a normal situation of an accident. 2) Themes, materials, actions, and the associations they evoke are to be gotten from anywhere except from the arts, their derivatives and their milieu. Eliminate the arts and whatever is familiar to them, as art galleries, cultural buildings, nightclubs, etc. Then, a separate art can be developed. This is the goal, because “Happening” is not a total art, it is a source of energy in a “quasi art” with an uncertain identity. 3) The Happening should be dispersed over several widely spaced, sometimes moving and changing locales. A single performance space tends to be static and limiting (like painting only the center of the canvas). The stage theater is static and prevents the use of a thousand possibilities; movies can be watched, but not physically experienced. So, Happening can be developed in several points in a trafficked avenue, or different floors and rooms in an apartment house, or in different streets or cities or anywhere around the globe. This will increase the tension and will provide independence to each act with no interconnections. 4) Time, closely bound up with things and spaces should be variable and independent of the convention of continuity. Whatever is to happen should do so in its natural time, without respecting a structured scheme. 5) The composition of all materials, actions, images and their times and spaces should be undertaken in an artless and again, practical a way as possible. It means the avoidance of form theory associated with the arts, such as a serial technique, dynamic symmetry, etc. 6) Happenings should be unrehearsed and performed by non professionals, only once. Ex. a house is burned down; love letters are left on a field until the rain ruins them. 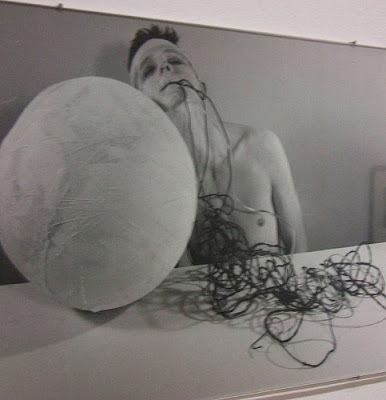 So Happenings were social manifestations materialized in a collage environment sensibility, a situation composed of sounds, time-durations, gestures, sensations, smells. The spectator was bombarded with sensations which he had to order on his own responsibility. Sometimes, the artists who took part in them seemed to engage in a desperate search for the unacceptable, for behavior which would restore them to a position as rebels an enemies of society (Lucie-Smith, 1995). 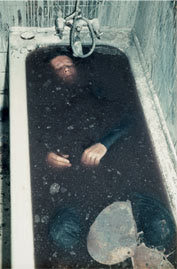 For instance, the English artist Stuart Brisley who spent many hours almost motionless in a bath full of water and animal entrails. And there were also expressions of sado-masochistic fantasy. 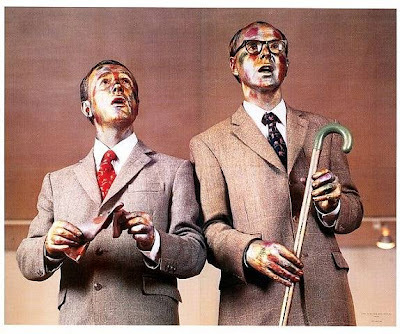 With an opposite funny tone, the Englishmen Gilbert and George performed a piece called Singing Sculptures, in which the two of them, with gilded faces, stood on a plinth and mimed to the music-hall song “Underneath the Arches”. The idea was to focus on style-stylishness, and the question of the division, or the lack of it, between the creator and what he creates.